The Annunciation Cathedral in Voronezh, Russia, is one of the largest Eastern Orthodox churches in the world and the third largest cathedral of any denomination in Russia. The current building was constructed on the site of an earlier church that was irreparably damaged during World War II and demolished in the 1950s. After an 11-year period of reconstruction, the church re-opened in 2009. The size of the new building and its expansive interiors led to the decision to install a modern AV system to help parishioners better see and hear the activities inside the church. 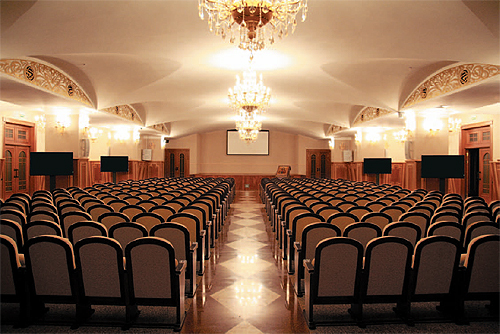 The integrator, Computer Networks Company, chose Extron fiber optic and matrix switching equipment for the first-ever fixed installation of a full AV system in a Russian cathedral. CNC Senior Project Manager, Ivan Safonov, says that Extron was chosen because, "We’ve been working with Extron for several years now because they produce high quality, reliable products. The Extron line of products is so large, and helps you solve the most complex tasks." Church officials wanted a sophisticated AV system installed in the Cathedral’s Conference Hall that would support image magnification, multimedia presentations, and recording. They wanted to be sure that video content could reach everyone, at various locations in the large room. The FOXBOX receivers' ability to be daisy chained allowed us to cascade signals to multiple destinations over long distances. CNC knew there would be challenges in integrating modern technology into the church’s classical Russo-Byzantine architecture. While the distinctive architecture of the cathedral required delicacy, the size of the building also became an issue, necessitating cable runs from 200 meters (656 feet) to 1,000 meters (3280 feet). Fortunately, the cathedral was a new construction and was designed to accommodate structured cabling for communications, including AV. Additionally, the finished walls and lack of windows in the Conference Hall made it difficult to hide equipment and cables, and created lighting issues for the video cameras. In addition to signal sources such as a PC and PTZ (Pan Tilt Zoom) HD video camera, users can plug laptops into two Extron Cable Cubby 300 enclosures located on the stage, providing VGA and audio connections. Displays include five 55" (140 cm) flat panel monitors that are mounted to moveable stands in order to preserve the architectural integrity of the walls. There are also four 20" (50 cm) desktop monitors and an HD projector with a motorized screen. The system also includes an Epiphan VGA Recorder Lite for recording the camera feed or other content. The integrator, CNC, tackled the distance issue by choosing Extron FOXBOX VGA, FOXBOX DVI Plus, and DVI 104 fiber optic signal extenders. The cable runs were quite long inside the massive cathedral, extending from the sources inside the Conference Hall to the equipment room and back to the displays in the Conference Hall. This made these extenders the natural choice. "The FOXBOX receivers' ability to be daisy-chained allowed us to cascade signals to multiple destinations over long distances," Safonov says. Daisy-chaining cut down on the amount of cabling needed, and Safonov was impressed by another feature. "The FOXBOX extenders send RS-232 control signals together with video and audio, which helped us save significantly on cable runs." The small size of the FOXBOX extenders was a benefit, especially the receivers, which can be placed behind displays. In addition to long distance video transmission, there was a need to route and scale signals to multiple displays with a mix of native resolutions. CNC chose the Extron ISM 824 Modular Integration Scaling MultiSwitcher. The ISM 824 performs video scaling and wideband switching in a single enclosure by using individual scaling cards within the one ISM 824 unit rather than multiple outboard scalers to handle the displays’ range of resolutions. Each scaled output supports resolutions up to 1920x1200, including 1080p/60. An Epiphan recorder was connected to one of the ISM 824’s outputs, in order to send video signals to two 23" (58 cm) monitors in the equipment room for system monitoring. "The ISM 824 was used because of its ability to integrate a variety of signals, and route and scale those signals to the various native resolutions of the destination displays,” Safonov says. “Given the size of the system, the ISM 824 was an ideal fit, and also allowed us to simplify the system design by having all signal processing integrated within the matrix switcher." Despite the challenges involved in performing this first-of-its-kind installation in a major Russian cathedral, the result was a fully functioning AV system integrated into the building’s existing classical architecture. The new installation provides the parishioners with enhanced listening and viewing of the activities inside this world-class cathedral.